Born in Jerusalem, David Shahar (1926-1997) was a fifth-generation Jerusalemite. 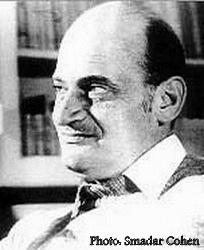 He studied psychology and Hebrew literatureat the Hebrew University. Shahar wrote novels, a seven-volume historical series of novels (8 books) set mostly in Jerusalem, collections of short stories and a children's book. He served for many years as chairman of the Hebrew Writers' Association. Shahar divided his time between Jerusalem and Paris, and was greatly read and honored in France. He received many literary prizes, among which the Prime Minister's Prize three times (1969; 1978; 1991), the Agnon Prize (1973), the French Prix Medicis Etranger (1981), the Bialik Prize (1984), the Neuman Prize (1987) and the President's Prize (1997). In 1986, he was appointed Commandeur dans l'Ordre des Arts et des Lettres by the French government.